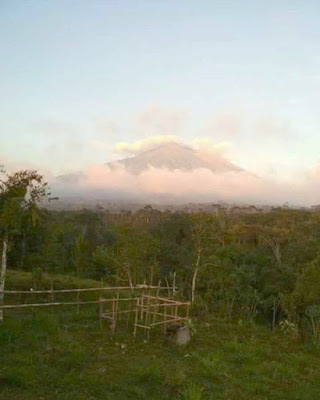 The volcano in Bali, Mount Agung erupted, is now calm again. Mount Agung is very confusing, twice erupts, twice also quiet instantly in a year. Mount Agung eruption activity is observed to decline this morning. The decline is seen from the blast of ash on the top of the mountain. Volcanic ash volcano of Mount Agung is getting lower and decreasing. Related Otorias explain that the height of the column of Mount Agung ash now ranges from 1,500-2,000 meters. However, the situation may change instantly. Because this mountain is very mysterious. In the short time since the first eruption in November 2017, the eruption of Mount Agung is now invisible. This volcano in Bali is now more calm. Although still visible clouds of smoke with a height of 1500-2000 meters from the peak. Initially this volcano in Bali showed signs of erupting in September 2017. A cloud of smoke is visible from the top of the mountain. Earthquakes are also very common around the mountain. But eruption estimates did not occur in September. But now the eruption is happening again. The first phreatic eruption of Gunung Agung occurred on Saturday, November 25, 2017, 5:30 pm. The altitude of the ash column reaches 1,500 meters from the top of the crater. On Sunday 26 November 2017, the eruption took place at 5:05 am, with the ash column height reaching 2,000 meters, dark-pressed dark gray. Then at 5:45 am, the ash height reaches 3000 meters. Although visually explosive activity has decreased, the zone of danger radius is still in the range of 8 kilometers from the top of the mountain with sectoral extension of 10 kilometers to the north, northeast, southeast, south and southwest. Status is still at Level IV, the highest level of danger. Improvement of stastus to "watch out" on Mount Agung which was established since 27 November 2017 and has resulted in people living around the mountain to evacuate. According to data from the Operations Control Center, Bali Disaster Management Agency (Pusdalops BPBD), the number of refugees on 29 November 2017 was 43,358 people spread in 229 refugee points.